FORT LAUDERDALE, April 12, 2006 - The woman who brought a human head into the United States in her carry on luggage pled guilty Wednesday as part of a plea deal, which will allow her to serve a maximum of one year in prison. Myrlene Severe's lawyer argued that even though she now understands that what she did is illegal by statute, she did not think what she did was religiously wrong. Severe, who practices voodoo, smuggled the head into Ft. Lauderdale-Hollywood International Airport earlier this year on a flight from Haiti. She says the head was to be used to ward off evil spirits. She pled guilty to improper storage of a human body part. Severe has practiced voodoo since childhood and is a priestess in her homeland of Haiti. Her sentencing is set for July 28th. 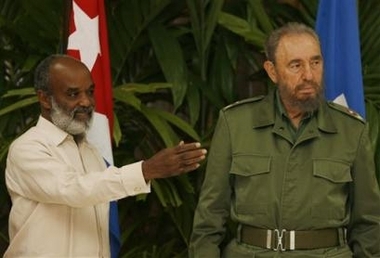 APRIL 12, 2006 - THE president-elect of Haiti, René Préval, initiated a working visit to Cuba this April 12, in response to an invitation from President Fidel Castro. Préval traveled with a delegation composed of various members of his future government and other Haitian figures, according to an official note published in Granma daily at the close of this edition. His visit coincides with the arrival of a group of Haitian scholarship students, as well as patients from that country who are to receive medical attention in Haiti under Operation Miracle, a Cuban-Venezuelan project that offers free ophthalmological care to poor patients in the Third World. According to the information, Préval and his delegation are to be received by President Fidel Castro and have a full agenda, including visits to places of scientific and social interest, as well as talks with other national authorities. Préval, former president of Haiti (1996-2001) and in 1991 former prime minister in the government of Jean Bertrand Aristide, won the presidential elections on February 7 with an absolute majority that gave him the presidency in the first round. PORT-AU-PRINCE, Haiti, April 10, 2006 (Reuters) - More than 20 Haitian judges and prosecutors are under investigation for suspected bribery and corruption, according to judicial authorities who created a new council on Monday to sanction those involved. "Those cases are being carefully studied and appropriate sanctions will be taken if necessary," Carlos Hercule, chief of staff for the justice minister, told Reuters. Several of those targeted have been removed from office pending the outcome of the investigation in the impoverished and turbulent Caribbean country. Justice Minister Henri Dorlean said administrative and judicial proceedings had been launched against six other judges and prosecutors accused of accepting money from those awaiting trial, in exchange for their release from prison. "The magistrates should be fully aware that they too can be tried if they deliberately commit fault," Dorlean told Reuters. The term "magistrates" includes both judges and prosecutors in Haiti. Dorlean made the comments after installing a council of magistrates, known as the Judiciary's Superior Council, to sanction members of the judicial system found guilty of corruption and serious administrative failure. Dorlean called the installation of the council "an important step toward reforming the judicial system," which is widely considered corrupt, lacking in credibility and subject to political influence. The head of the U.N. mission's human rights unit in Haiti accused judicial officials and the U.S.-backed interim government last week of illegally detaining most of the 4,000 people behind bars in Haiti. The U.N. official, Thierry Fagart, said most prisoners had not been formally charged or tried and that many had been held in "preventive detention" for longer terms than they would face if convicted of crimes. Critics say the un-elected interim government that has led Haiti for two years installed the new council without consulting the administration of President-elect Rene Preval, who is scheduled to take office on May 14. 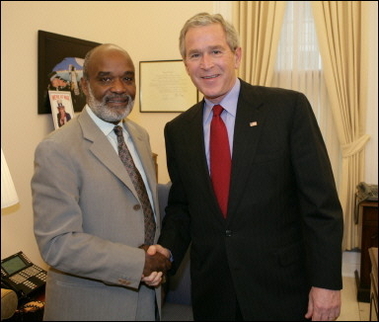 Preval won a February election, the first since former President Jean-Bertrand Ariside was driven out during an armed revolt in February 2004. A new parliament is to be seated after an April 21 runoff election. The May 12 forum will take place only two days before the inauguration of President-elect René Préval. Copyright 2006, Sun-Sentinel Co. & South Florida Interactive Inc. Reprinted from The Sun-Sentinel of Monday, April 10, 2006. APRIL 3, 2006 - South Africa is in no hurry to send ousted president Jean Bertrand Aristide back to Haiti without first securing agreement from the new president, the foreign minister said on Monday. "South Africa as the host country is still willing to have Jean Bertrand Aristide here," Nkosazana Dlamini-Zuma said after talks with French Cooperation and Development Minister Brigitte Gerardin. "We are not in a hurry to ship him back to Haiti. His return will have to be agreed by the president and the government of Haiti," she said after meeting her French counterpart for two hours in the capital. Dlamini-Zuma and Gerardin, who is in South Africa for two days of meetings, said they discussed the situation in other African countries as well as the subject of Aristide, who fled into exile in 2004. "In principle he will not reside in South Africa for life. But he is not going to Haiti next week either. We are waiting to see the aftermath of the elections and how the government starts working," she said. Aristide, who has been living in exile in South Africa since May 2004, said in February that he hoped to return to his country and devote himself to education. Haitian President-elect Rene Preval, who is to be sworn in on May 14, has left the door open to Aristide's return, saying he has a right as a Haitian citizen to live in his country. But the United States has taken a dim view of a possible Aristide return, saying the former president is a man of the past who would detract attention from Haiti's task of building stability and democracy. Only 10 percent of some 4,000 prisoners have been convicted, U.N. spokeswoman Marie-Evelyne Petrus-Barry said. The impoverished country's largest prison, the national penitentiary, has grown so overcrowded that it can no longer admit inmates. Soon to be published, the voluminous criminal record of Patrick Elie, a possible member of Rene Preval's de facto government. In a statement, the peacekeeping mission said the situation "is contrary to the universal principles of human rights and the guarantees of personal freedoms preached by Haiti's Constitution and laws." The U.N. mission called on Haitian authorities to immediately appoint a commission to review each of the prisoners' cases. Officials at Haiti's Justice Ministry did not immediately return calls seeking comment. U.N. officials did not provide details about the prisoners' legal status, but critics of the Haitian government have said they believe the vast majority have not been charged with a crime, let alone convicted. Observers say Haitian courts are underfunded, overwhelmed by thousands of backlogged cases and have been repeatedly disrupted by political turmoil, a constant in Haiti's history. Haiti's U.S.-backed interim government, appointed after a February 2004 revolt toppled President Jean-Bertrand Aristide, has pledged to reform the judiciary but has been hampered by a lack of personnel and equipment. President-elect Rene Preval, whose strong backing among Haiti's poor propelled him to victory in Feb. 7 elections, will be sworn in May 14. Some inmates have been held for years without seeing a judge, and most have served more time than they would have if convicted, according to local rights groups. "They've essentially been found guilty before even going to court," said Jocelyn McCalla, executive director of the National Coalition for Haitian Rights in New York. McCalla blamed the failure to address the cases on a lack of political will and a shortage of legal professionals. Critics have alleged that some of the detentions are politically motivated. Among the more prominent inmates is Yvon Neptune, prime minister under Aristide. Neptune has been jailed since July 2004 on accusations that he masterminded the killings of political opponents before the revolt. Neptune denies the charges, and no trial date has been set. 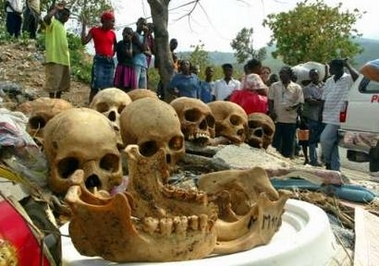 APRIL 1, 2006 - A woman who was arrested after a human skull was found in her luggage has agreed to a plea deal that might keep her from being deported to Haiti. Myrlene Severe's case has proved complicated for prosecutors because she says that she was carrying the skull for protection as part of a voodoo ritual. Her lawyer said that she had no criminal intent and the skull was strictly to be used for protection as part of her religion. Severe was on Lynx International Airlines Flight 203 from Haiti on Feb. 9 when customs officials examined her luggage and found the skull in a rice bag filled with grass, banana leaves, dirt, rocks and an iron nail. She had not declared in her paperwork to enter the country that the skull was in her luggage. Severe, who lives in Miramar, is a Haitian national who has permanent residency status in the U.S. Her attorney said she is seeking citizenship. If a federal judge agrees to the plea deal, Severe will plead guilty to a misdemeanor state charge of illegal storage with a maximum penalty of one year in prison. If she had been arraigned on federal charges, she could have been sentenced to up to 15 years in prison. After a hearing Friday, Severe said she wants to be left alone and get her privacy back. She has expressed anger about reporters trying to question her regarding the case. Severe's lawyer said if she is allowed to plead guilty to the state charge, she will stand a better chance of not being deported. At a hearing on April 13, Severe will find out if a federal judge will approve the deal. Nearly a decade after the station house attack on Abner Louima, an act of police brutality that had epic consequences for the city and its police force, a federal judge told a former police officer yesterday that his perjury had prevented a full accounting of the crime. The judge, Reena Raggi, who handled parts of the case in Federal District Court in Brooklyn before her appointment to the United States Court of Appeals for the Second Circuit, rejected a request for leniency and reinstated a five-year prison sentence for the former officer, Charles Schwarz. "This is, and was, a very, very serious crime, the first link in a chain that caused tremendous, tremendous problems for this city," Judge Raggi said. Mr. Louima was sodomized with a broomstick in a bathroom of the 70th Precinct station house in Brooklyn in August 1997. Judge Raggi said that Mr. Schwarz had failed to accept responsibility for lying to protect other officers, including Justin A. Volpe, who attacked Mr. Louima. She said there was another officer in the bathoom, and that "it was either you, which I think is highly probable  in fact I think it's more than highly probable  or it was someone else." A lawyer for Mr. Schwarz, Ronald P. Fischetti, disputed that assertion in an interview, saying, "Chuck Schwarz was never in the bathroom, never knew what was going on in the bathroom." The hearing, convened to address an unforeseen sentencing technicality, ostensibly concerned matters agreeable to prosecutors and defense lawyers alike. But even without Mr. Louima in attendance, the proceedings quickly became a forum on truth and reconciliation as Judge Raggi sketched the broad shadow cast by a narrow lie. Four days after the attack, Mr. Schwarz and Mr. Volpe were charged with assault and sexual abuse. Mr. Volpe, who has told federal officials that Mr. Schwarz was not in the bathroom, was sentenced to 30 years in prison. Prosecutions of other officers have ended in acquittals and overturned verdicts. Convicted of perjury for testifying that he did not lead Mr. Louima to the bathroom, Mr. Schwarz agreed, before Judge Raggi in 2002, to a five-year prison term. In exchange, prosecutors agreed to drop charges that he had violated Mr. Louima's civil rights. Both sides entered the agreement under the mistaken belief that Mr. Schwarz would most likely be eligible for a sentence reduction, lawyers said yesterday. Before dozens of supporters of Mr. Schwarz, including his wife and a priest, Judge Raggi said she would consider a motion to vacate the sentence and accept an agreement for a new sentence of between 47 and 60 months. The low end of that scale would qualify him for immediate release. But before vacating the sentence, Judge Raggi told Mr. Schwarz to expect the worst and offered him time to confer with his lawyers. Mr. Schwarz, who according to his lawyer had come to court by bus from a prison in Minnesota, told the judge he was ready to proceed. Mr. Fischetti asked Judge Raggi to consider the circumstances of Mr. Schwarz's imprisonment, including months of solitary confinement in a 7-foot-by-9-foot cell. He recited his history as an altar boy, Boy Scout, high school football captain and marine. He spoke of the Schwarz family's financial and medical troubles, how hard it was for them to visit an out-of-state prison, and the harassment they face. "He's known as the Louima cop," Mr. Fischetti said. The judge invited Mr. Schwarz to speak, strongly hinting that acceptance of responsibility was lacking from the documents filed to support a reduced sentence. Mr. Schwarz repeated his lawyer's plea for leniency, speaking of family obligations and a 2-year-old son he had seen only four times. "It's going to be difficult to put my life together," he said, concluding, "With regards to the perjury, I accept responsibility for it, your honor." Judge Raggi said: "Implicit in that is that you know more about the events that occurred on that date than you have ever told anyone." She asked if he wanted to say anything else, and Mr. Schwarz mumbled inaudibly. Then she rejected his lawyer's arguments and dismissed his "very belated and halting acceptance of responsibility." "Mr. Schwarz," Judge Raggi said, "I think you know where this is going." He will be eligible for release next year. Copyright 2006 The New York Times Company. Reprinted from The New York Times, New York Region, of Thursday, March 30, 2006. MORE NEW YORK, March 30 (Reuters) - Haiti is set to host a new donors' conference in early summer to discuss extending its 2004 Interim Cooperation Framework (ICF) aid program through December 2007, sources familiar with the talks said on Thursday. So far the ICF has disbursed more than $700 million of the $1.08 billion pledged in 2004 and plans are to reassess the program with a view to committing additional funding for future projects, the sources said. PORT-AU-PRINCE, Haiti, Mar. 30, 2006 -- Gang members, pistols tucked underneath their sport shirts, watch idly from a street corner as children walk to school and housewives carry food home from a market. Not a policeman is in sight. If any particular place in Haiti needs police, it's the teeming streets of the Cite Soleil slum in the capital, Port-au-Prince. But all it has is the crumbling ruins of an abandoned police station. The battered, impoverished Caribbean nation has teetered on the brink of anarchy since former President Jean-Bertrand Aristide was ousted in a bloody rebellion in February 2004. The U.N. peacekeeping mission that arrived within months of the rebellion has been training a force, but the pace is slow. Every three months, 200 more recruits complete their training and are ready to hit the streets. But Haiti needs 20,000 policemen and has only about 6,000, says Juan Gabriel Valdes, the U.N. special envoy to Haiti. "To reach 20,000 will take several years," he said in an interview. Meanwhile, kidnappings are alarmingly frequent in the capital. Its few foreign business executives speed through the streets in bulletproof vehicles with armed bodyguards. Haiti is also a key transshipment point for fast boats bearing cocaine from Colombia toward the United States, according to a State Department report issued earlier this month. While Haiti's police force is built up, security is provided mostly by about 1,750 U.N. police and 7,250 U.N. peacekeeping troops, who are generally unaccustomed to taking a police role. In Cite Soleil, Jordanian U.N. troops hunker down in armored personnel carriers, barely interacting with the Creole-speaking public. Shanty walls are pocked with hundreds of bullet holes from U.N. troops' clashes with gang members over the past two years. President-elect Rene Preval, whose strong backing among Haiti's poor propelled him to victory in the Feb. 7 elections, faces the challenge of bringing security and jobs to Haiti. He wants the U.N. peacekeepers to stay, but prefers a stronger police contingent. For much of Haiti's history, the police were a repressive arm of the military that supported dictatorships or ruled outright after seizing power in coups. Aristide dismantled the military after U.S. troops restored him to power in 1994. The military had toppled the elected leader in a coup three years earlier. The scarcity of police is also due to newly elected leaders firing police officers and hiring new ones loyal to the leaders, and the objective now is to create a professional, unpoliticized force free of corruption and criminal behavior, Valdes said. Valdes said increasing officers' salaries -- now averaging about $100 per month -- would help. Haitian police have committed arbitrary arrests, torture and even summary executions, U.N. human rights official Thierry Fagart said last October. Haitian National Police chief Mario Andresol has tried weed out violators, among them 15 officers arrested for their suspected role in killings last August at a soccer stadium in the capital. The U.N. Security Council last month extended the Brazilian-led U.N. peacekeeping mission through Aug. 15, and it could be renewed again. "There is no public agency in Haiti capable of ensuring security," said Daniel P. Erikson, an analyst with the Inter-American Dialogue think tank in Washington. "In the short term, the withdrawal of U.N. troops would be a disaster for Haiti."